Battle of the Paddle 2011 ROCKED! Conditions in Waikiki were (mostly) good, with a bit less wave action and shallow reef, but we were still out in the water having fun, and that’s what counts. 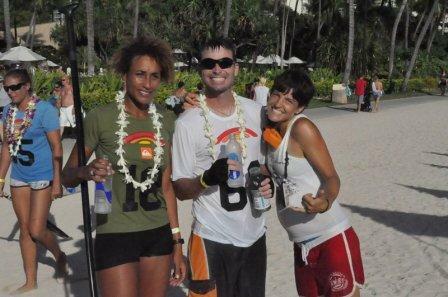 Three of our head instructors who teach our stand up paddle lessons competed in the Battle of the Paddle. The Open-Age 4 mile race was first, with our head instructor Heidi joining in. Not being completely sure if she could finish the race (at 3 ½ mo. pregnant), she was stoked to come in 3rd in her division, but even more excited about beating her time from last year – on a smaller board! Next up was the grueling Elite Race, a 5 mile race lacing in and out of waves with intermittent sprints on the beach between each lap. The paddlers lined up along the shore – about 100 in all. It was a sight to see. 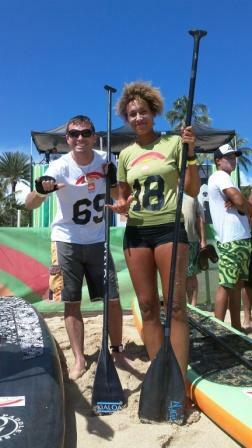 In the midst were our head instructors Nate Burgoyne and Jodi Kealoha. Just to finish the race is a feat in and of itself, and both of them performed amazingly, despite going over reef in knee-deep water. 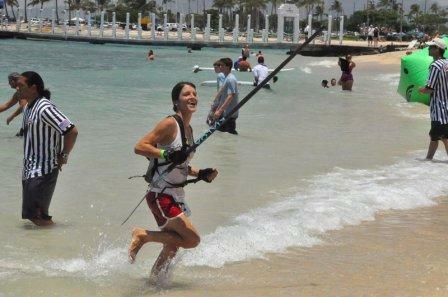 Jodi also joined in on the surf relays, with her team coming in 3rd – with some $$ to boot.